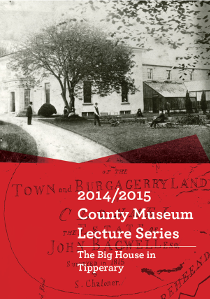 "The Big House in Tipperary"
Tipperary County Museum's lecture series aims to highlight the rich architectural and historic tradition of the County. With diverse topics from the role of women, to furniture and interiors, to the social life of the family, to the life of servants, and the role of landlords, there is something to interest all. The opportunity to access objects and archives from some of the County's Big Houses and to handle replica artifacts adds another dimension to the series. Culminating in a field trip which allows participants to see in reality many of the points discussed in the series.